It is very important to get your child the right equipment even if it may seem that equipment is universal. Not every bat will be right for every player. And this applies to all the different parts of the softball player. Starting at 6U onwards, HRYS supplies helmets (several shared among the team), bats and balls to players. Catchers protective gear is also supplied. All of these have been used, but are maintained in operational order. For Legends and Glory teams, by the time girls move into 10U, most parents opt to start purchasing their own equipment. Below, we cover each of the pieces of equipment starting with the helmet, should any parent want to purchase equipment independent of their division. The helmet is an important part of softball play. NOCSAE approved batting helmets with extended ear flaps, which cover both ears and temples are mandatory for all batters, on deck batters, base runners, non-adult base coach, non-adult bat & ball shaggers in live ball territory, even if the ball is dead. Batting helmets must have NOCSAE approved attached face mask/guard. 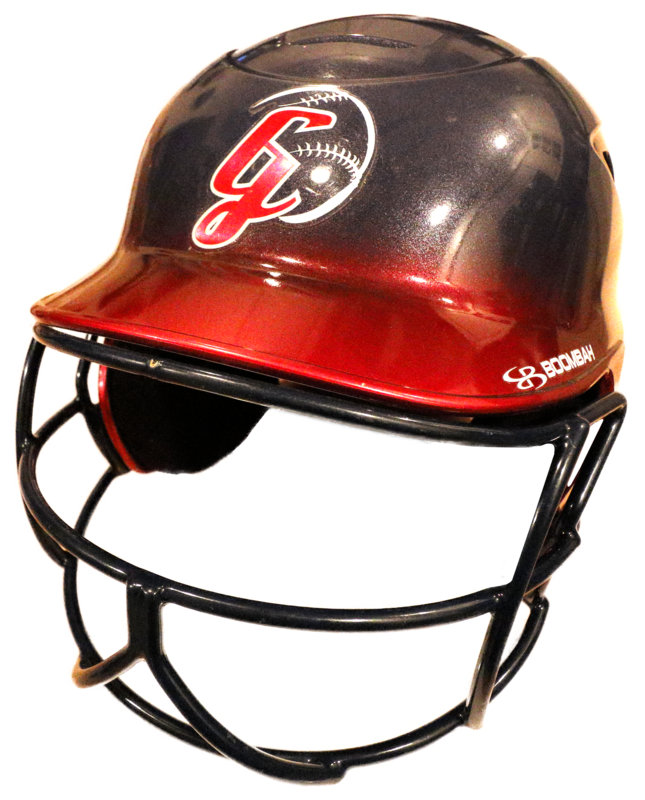 A commercially manufactured face mask/guard may be attached to a batting helmet, provided it is attached by the manufacture; or a face mask/guard may be attached to a helmet that does not have a face mask, provided the attachment procedure is approved by the manufacture. A chinstrap is optional though encouraged. As ball speeds increase, so too does the danger of a softball hitting one of the players in the face. To minimize risk, all players in the infield are required to wear a protective face guard. Since the face guard comes into close contact with each players face, and is matched to the dimensions of each face, it is recommended that parents purchase face masks for their players. When properly fitted, there should be little wiggle, and straps should all be tightened and secured so as not to distract the player. Guards can come in both plastic and metal, but we recommend the metal ones for longevity and extra security. Sizes are very basic with there being a "Youth Size" and a "Adult size". Those aged 12 or younger generally would fit well into a Youth size Guard, and everyone older can opt for the Adult size. Once the girls get involved in higher end softball, at later ages, they will most likely require a glove based upon their position. 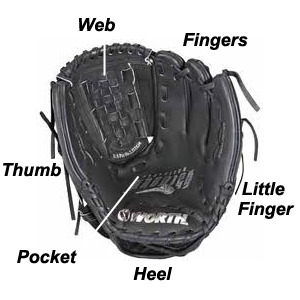 There are specialized gloves made for the catcher, pitcher, 1st base, infield and outfield. For all HRYS teams up until the 14U level, it's probably advisable to simply purchase a typical infielder or outfielder's glove. Infielders gloves have slightly shorter fi ngers and are geared towards the girl making a quick catch and throw to get a runner out while outfielders gloves are larger, and meant to assist outfielders in making flyball catches. We strongly recommend that the glove be made of leather, and not a synthetic leather type of material. Synthetics tend to be stiffer and impervious to shaping. Once the glove is purchased, the parent should either have it steamed at a sports store, or we recommend purchasing glove oil to soften the glove and make it more pliable. In addition, in order to shape the glove, we recommend putting a softball (of whatever size they are using in their division) inside, and either wrapping a small towel around it, or purchasing a velcro based glove wrap (Amazon has an inexpensive, but great hot glove wrap set that can be found here - product link). Shaping and maintaining the glove can make a significant difference in how successful the girls are in their fielding and catching skills, so don't skimp on this. Before your season starts, there are three criteria to consider when choosing a softball bat: length, weight and drop. All of these can affect your swing, so be sure to know how and what to look for in each design. After researching, we highly recommend you ask other girls on the team if you can handle their bats to see if they feel right for your player. Place the bat knob at the center of your chest and extend the barrel out toward your fingertips. If you can touch the end of the bat with your fingertips, the bat is an appropriate size. Place the bottom knob of the bat in the center of your chest facing outward. If you are able to reach out and grab the barrel of the bat, then it is an appropriate length. Stand the bat up vertically against your leg. If the bat reaches your mid-hip, it should be a suitable length. Bat weight can vary among models, and it’s really up to your preferences. If you’re a stronger player, you can probably get away with swinging a heavier bat. Remember, though, that you want to have efficient bat speed at the plate, and a swinging a softball bat that’s too heavy for you can hinder your performance. A good test to see if you can handle a certain bat weight is to hold the bat with one hand, with your arm extended from your side, for 30 seconds. If you can keep the bat extended without dropping it, you should be able to properly swing that weight. The drop is the difference between length and weight. A lesser drop will indicate a heavier bat, which may be too much to handle at the plate. Take your length and weight numbers from before and try to find a bat with similar measurements to fit your needs. Finding the right softball bat could help enhance your at-bat performance. 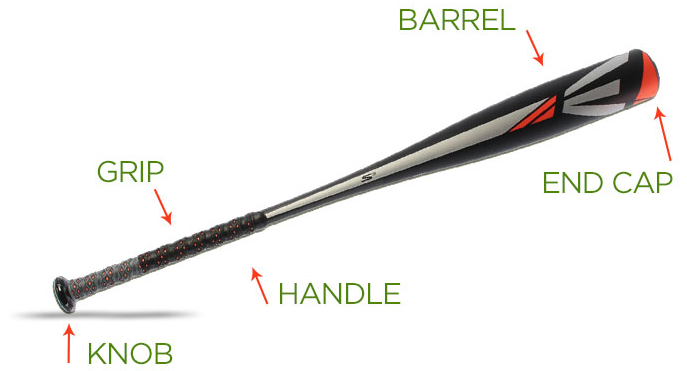 Keeping these tips in mind can help in making sure the bat you choose will be a home run. Because players legs and waists can vary so much between girls, it's hard to offer any universal sizing advice other than to try on a pair of pants, if possible, before buying. We have found that most sporting goods stores have a poor selection of pants, but we've had good results sorting through their pants to get a feel for the quality of the brand, and then purchasing a properly sized pant online where the selection is often much greater. If any parents have found a good source, please pass this on to your coach, or send us an email at webmaster@hrysfastpitch.com. Sizing a cleat is very similar to sizing a sneaker. The only difference is that you want a pair of cleats to fit tighter than relaxed sneakers. This is to avoid the foot from sliding around in the cleat, which can cause blisters. For children, it is important to avoid over compensating for growing room. It is best to fit them for a correct size and then go up half a size, leaving no more than a fingers worth of room behind the ankle. A good tip for sizing metal cleats, is to look at woman’s metal cleats if you cannot find a men’s cleat in a small enough size. They usually fit the same, minus the sizing difference. Always put your cleats on in the dug-out. Wear sandals or sneakers to the field and when walking around between games on asphalt and concrete. This will prevent the cleats from wearing out quickly and also prevent you from slipping on hard surfaces. Clean your cleats after each use. Get all the dirt and mud off of the bottom and side of the shoes. For mud, wait until it dries enough to use a stick to knock the dirt off. Keeping your cleats dirt free help make the leather and synthetic materials last longer. When you are done playing, let your cleats air dry to avoid moisture from building up, which can lead to mold. For pitchers, look for cleats that have a reinforced toe. This helps the cleat last longer for the unique toe drag of pitchers. If you can’t find any you like with reinforced toes, there are accessories that HomeRunMonkey carries that can be applied to the toe to avoid the cleat wearing out too soon. Pitchers should avoid high top cleats because they restrict the ankle movement while pitching.